We had a wonderful day with Leo. He bought us lunch which we didn't expect. He gave us so much information about the area . Leo speaks very good English. He is very professional, dependable and very knowledgeable about the region. We spent three days with Leo and had a great time. He also knows all the locals which helps! We would highly recommend Leo. Leo was super knowledgeable about the history and culture of the parts of the country we toured through. We so enjoyed the whole experience with Leo. He is such a warm and happy person. I would recommend his tours to anyone wanting a unique and warm and exciting tour of Chili. Like having a friend show the town and areas he loves. Fun, different, and informative. Long day, but so worthwile seeing Valparaiso. Leo was very knowledgeable about the town and all the little side streets and out of the way areas. Leo gave an excellent tour of Santiago. He is very knowledgeable about Chile and Santiago. The pace was just right and his driver was excellent! I strongly recommend Leo. We spent a fun filled afternoon with Leo seeing the sites of Santiago city. He was knowledgeable and considerate. His photography tips were great and he made sure we got the images in the best possible light. We loved sitting down and sharing a drink with him and sampling a Pisco Sour! Thanks Leo, 10/10! We loved our sense of humour and the laughs we had. Leo is an outstanding tour guide. My spouse and I had a fabulous day with him, creating lasting memories. He ensured that we experienced Chile through seeing beautiful sites, meeting interesting people and eating delicious national foods. He was exceptional and we benefitted from his extensive knowledge, his friendliness, his passion for life and his kindness to others. We had a fantastic tour of the city of Santiago with Leo. He showed us all the highlights of the city, including the different sections of the city and information about the people who lived and worked there. Our tour included both driving and walking and it was nice to stroll in the Plaza De Armas and have a guided tour of the Pre Columbian Art Museum. Leo was very friendly and seemed to know everyone in the city! We would highly recommend him. Very knowledgeable and flexible. We learned a lot about the culture of the area. Our third (!) trip with Leo to Perez Cruz and Santa Rita vineyards. Terrific day out of the city. Leo again spoke to my family of 4, including 2 college students, about life in Chile: politics, economy, social issues, history. We learned non-stop and Leo tried to accommodate us by driving us past certain things in Santiago on our way our or back to the vineyards. He wants his visitors to leave happy and we surely did! Leo is a terrific guide and a wonderful, caring person. Book Leo for any trip. Our second day trip with Leo during our one week in Santiago. Leo graciously answered our questions about politics, the economy, the educational system, etc.. We journeyed east into the Andes, stopping for photos and having fun learning how to create memorable and beautiful pictures. Our short hike into the Andes was appropriate for our family of four, 2 college students and 2 fit adults in their 50s. If you want a challenge, ask. Leo is very accommodating. He wants his visitors to have a good time. Our first day with Leo, exploring Valparaiso and Vina del Mar on Christmas Day. Terrific time! No traffic on this holiday, so things were closed but easy to maneuver through the towns. Leo guided us, making the most of our time. We both drove around and walked through town. Lots of public art which Leo explained as it related to indigenous people and Chilean politics. My family of four with 2 college students loved our day trip to this UNESCO city. Run to sign up with Leo for this trip. Great tour, highly informative, flexible (which was important with our 3-year old) and made the day very relaxed. Highly recommend and include the stop at Concha Y Torro winery! We had a private tour with Leo to tour Valparaiso and Vina del Mar last December. We also toured Casablanca Winery and had lunch there. It was a wonderful tour. Leo was an excellent tour guide who has a warm personality. He is fun and very motivated. Further, Leo is a good photographer. Everywhere we went, he would not only help us take nice group pictures, but also teach us photography techniques such as finding the best view and framing the best picture. It was an unforgettable experience for all of us. Outstanding day with Leo in beautiful Chilean wine country. Like the Napa Valley 20 years ago. Genuine people living the wine life. Leo customized the day to fit our interests. Just a perfect day in sunny Chile. Leo is a passionate guide who clearly loves what he does. He has a wealth of information. He responded promptly leading up to the tour, and his English is perfect. Highly recommend him. Leonardo was fantastic. He played with the kids and had a ball. So many great things to see. Thank you! Leo was a fabulous guide for one of our tours while we were in Santiago. He took us to see the penguins near Zapallar and then decided to extend our trip to Valparaiso. He was knowledgeable and a lot of fun to be with. His affinity for plants and his overall personality made the trip exceptional. Highly recommend. Leo was right in time to meet us at our hotel and was friendly and welcoming. We had arranged a tour for Monday not realising that all the museums are closed so worth knowing if you want to visit any. Leo is very knowledgeable about his country's fascinating history but is equally happy to talk about more recent events. He took us to some super areas around the city that we will visit again ourselves. A great guide!! Leo was so friendly and knowledgeable. He loved sharing his love for Santiago. Lots of fun to be with. Santiago came alive through our gracious host who not only knew the city very well but also gave me free camera shot advice. Leo was very accommodating to our schedule and helpful. Leo is a force of nature. His indestructible cheerfulness and enthusiasm for the scenery is hard to resist. Touring feels a bit like hanging out with him while he visits his favourite places and countless friends. At the same time, he is very professional and everything ran very smoothly. He prompted us to include Valparaiso in our tour, which we hadn't booked, but was an excellent idea. Leo is a force of nature. His indestructible cheerfulness and enthusiasm for the scenery is hard to resist. Touring feels a bit like hanging out with him while he visits his favourite places and countless friends. At the same time, he is very professional and everything ran very smoothly. This was a unique tour, getting to see real penguins, and a truly enjoyable day getting out of the city of Santiago and exploring a different landscape. Leo was knowledgeable about the region, and obviously cared that we had a good experience. He provided snacks and water, the car had wi-fi, and he took us to both a cute local coffee shop for a break, and restaurant for lunch. In both places, he helped us order, so a language barrier wasn't a problem. Leo is also a photographer, which was nice! The tour gave me a general view of Santiago which was my expectation due to the short time I had. Leonardo was helpfull and fully answered my questions. Next time I go to Santiago I will be able to organize myself better and do it by myself. The tour showed me that Santiago merits a longer visit. Leanardo and his driver did an outstanding job for us on the tour of Valparaiso and Vina del Mar. They showed the places we wanted to see and took us to an outstanding location for lunch. We had been on an airplane all night and were exhausted. They were understanding in every way to learn as much as they could about Chile and the two locations we had on the schedule to visit. We got back to our hotel on time for our meeting. I was delighted with this tour. Great job! TOUR GUIDE RESPONSE: Hello John Thank you very much for your great comments and I am super happy you had a excellent tour and experience in Santiago , Chile when you you book a tour with Tours by Locals and me I hope see you again Leonardo C.
Leo was amazing. Could not have asked for a better guide. I ended up being very sick on the tour and he was so accommodating and helpful. Could not recommend enough. He was flexible but at the same time the tour was well planned. His car is very nice and spacious and his English is fantastic. Enjoyable trip to the wine country and Valparaiso. We had a delicious lunch at the winery, and Leonardo helped us troubleshoot a problem with our luggage. I highly recommend his trips. We had a great tour with Leo. He was a very good guide and a lovely person. We went along the coast from San Antonio to Valparaiso. We went on a walking tour of Valparaiso including a trip on one of the old funiculars. Leo was very informative about Chile and was also very good company. We also had a very nice stop at a winery. It was a very enjoyable day. The only downside was the shortness of our trip and this was due to the cruise ships altered schedule. We would love to have had longer. A brilliant day visiting along the coastal route from San Antonio and Valparaiso and wonderful lunch at Casa del Bosque winery. A 10 hour tour could be dull, but not with Leonardo. He was waiting for us at the pier (even that we were early). He was both knowledgeable & delightful. He personalized our tour & we enjoyed every minute of it. If we are ever back in Santiago we would love to tour with him again! Once again Leo did not disappoint. We traveled away from the main tour groups to a destination that offered fabulous views. We stopped at an old mining camp and Leo gave us insights into the life people lived there. We traveled further and had a surprise picnic within view of the volcano. He offered a spread of Chilean foods and wines, including freshly fire-oven baked empanadas. Truly a memorable day. Our second day with Leo & it was great once again. We visited the lovely Viu Manent Winery & had a great informative tour. After informing Leo of our bad luck with closed museums in Santiago, he offered to change our itinerary for a visit to the Colchagua Museum in Santa Cruz. What a fantastic museum & exactly what we were looking for. Leo then took us to eat at lovely restaurant in another winery. He speaks excellent English, drives well, on time & is filled with information & is flexible as you see. Excellent guide- friendly and exuberant. Leo was amazing. He knew a lot about all of the areas we drove through and was super flexible about what we wanted to do. We stopped at a great Winery in Casablanca and had a wine tasting. Then he took us to lunch at a nice local restaurant, where he introduced us to the staff and together we tried different foods. He was very knowledgeable, personable, and friendly. He was very excited to share the local culture with us. We highly recommend touring with Leo! Leo was excellent. He demonstrated deep knowledge of the history of Chile. He was very courteous and personable. He was also very flexible with our needs. Leo has a extremely positive attitude that radiate confidence. I would definitely contract him again whenever we go back to Chile. The Aconcagua tour is a great day trip from Santiago and totally worth it. One shouldn't believe all those horror stories about the border crossing on the Internet. Leo was a great guide with a deep knowledge of his home. He was open for everything we suggested and made ideal suggestions himself, too. Leo was fun, knowledgeable and well planned out with attention to details. Would love to do another tour with him if we had a chance! Leo is amazing! I would highly recommend his tour to Viña del Mar. He shows you all the attractions and makes informative and fun, including a stop for ice cream by the beach. We can't say enough about Leo. His transportation was 5 stars, he was fun, informative, interesting, and great sense of humor. The route he took from the port to Santiago, wad beautiful! He arranged to stop along the way at a wonderful local restaurant for lunch. Divine!! He found an artist's street fair for us to walk through and some specialty shops that tourists wouldn't normally go to. The entire trip/ tour was perfect. Ask for Leo if you want the best tour. We just can't say enough about him! Leo was fantastic and very accommodating. After a very long flight most of us fell asleep in the car and Leo drove around pointing out the most interesting places for my husband (who was awake)! Would recommend Leo and his tour - I hope to be able to finish it next time! On time, good car, safe driver, friendly, willing to talk, answering questions, explaining, teaching. ...The winetasting was great ( winery factory tour could have been skipped for us, tasting was more than enough), walking tour in Valparaiso was lovely and could have been longer for us. We highly recommend Leo. We had an absolutely superb day with Leo! I cannot recommend him highly enough. He was pleasant, informative, fun; and did everything possible to make our day as enjoyable as it could be. He listened to what we wanted to see and do, and gave us enough time to take all our photos, even stopping without us asking when he considered there was a good photo location. We saw so much with Leo; but maybe the highlight of the day was stopping at his favourite cakeshop and trying the variety of cakes he suggested! Leo C is one of the best, if not the best guides I've had having traveled all over the world. He is friendly, interesting, extremely knowledgeable, and has a true passion for his work. He gave us exactly the kind of tour we wanted, experienced all we hoped for, and was a pleasure to be with for our day tour. Tour was great. Leonardo gave us a educated and informative briefing of the city and country. Although we started with a miscommunication of not picking us up at airport as scheduled, he more than made up for it with his professionalism. Our guides were great. Patient, clear, informative and enthusiastic. Plenty of local knowledge which was clearly explained. A palpable sense of pride for the lovely city of Santiago and its history. In addition, my husband walks with a stick and this was at all times accommodated. We felt safe and enjoyed ourselves. Thank you to all involved. Leo was always on time knowledgeable & courteous. We spent three days touring with Leo in addition to him dropping us at the airport for our flight home.From the moment he met us at the cruise terminal in Valparaiso, through his city tours of Valparaiso and Santiago with wonderful touring int he countryside in between, we enjoyed every minute of our time with this knowledgeable and passionate guide. Leo took us places that no other tourists would ever find. You should see the shots of the Andes we were able to get! Thanks so much Tours-by-Locals. This was a wonderful day to the Chilean coast to see the country side and penguins at the beach. We were not disappointed. The real surprise was a special lunch on the beach with fantastic food. I would highly recommend this tour. This was a very scenic tour made even better by a wonderful tour guide. Our guide Leo provided for every detail and was both extremely personable and knowledgeable. We had a wonderful day and left with a new friend. I would definitely take this tour again and highly recommend this guide! Great tour with Leo. Transfers were comfortable and punctual. Leo was friendly, his tour of Valparaiso informative, and wherever possible he went above and beyond (ensuring that we were safely checked in to our Santiago hostel). Would highly recommend. Leonardo a truly excellent guide with deep knowledge and love of Chile which comes over in his approach - informative and engaging: he is happy to discuss anything. Efficient, flexible (we sensibly had more time in Valparaiso (fantastic!) and dropped Viña del Mar. Good advice too about leaving valuables in hotel led to "El Classico" bird poo attempted. robbery leading to only a change of clothes and shower and nothing more serious. Airport pick up on day and after tour on time and efficient. Brilliant! The penguins were amazing and Leo is a knowledgeable and enthusiastic guide. Highly recommended! Leonardo is a top guide, a true professional with a sense of humour. He gave us an overview of Santiago, a Valparaiso experience and a drive through Viña Del Mar to a wonderful local restaurant literally on the side of the sea, plus a visit to a winery. He had great local knowledge and obviously loves providing individualised tours. We thoroughly recommend him! TOUR GUIDE RESPONSE: Hi Chris and Fiona Thank you for your review with nice comments and how you can tell ...I love what I do ..! You were a very nice persons that why the tour went so nice and fun Thank you and a big huge Leo C.
By Marcela G: Leonardo was wonderful! Our stay in Santiago was so short and we had a project to work on, so it was somewhat of a tense morning, considering our original guide had an emergency. But Leonardo came and saved the day! He came early and said he would be replacing our previous guide. I really enjoyed his personality and the positive vibe he held during our walks along Santiago. He took us to great locations to shoot, and afterwards to a beautiful thematic seafood restaurant. Thank you Leo! Professional and very friendly guide. I enjoyed the tour very much! I was beginning to question my decision as the initial drive is a little long. But when you get to the island, Penguins were abundant along with pelicans, and other birds. The coastline is just beautiful and the walk easy. The lunch spot is just excellent in food quality and flavor. Eat outside if the weather allows. On the way back there will be some napping and digesting. Leonardo was very knowledgable, interesting, and wonderful with my 12 year old son, doing a great job of making the tour fun for our 3 generational family. I would recommend him highly. Excellent day trip! Lots ofunusual sights! Very friendly and informed guide. My day hike in the Andes with Leo was very enjoyable. Leo took us on a wonderful and welcomed change of pace day into the Andes. The scenery was amazing. We made numerous stops for photographs and explanations of the environment. The comfortable drive itself showed us much more of Chile than simply a city tour. Our party of 4 had a great day and especially enjoyed our stop for lunch. This day was our last before returning to North America. It was the perfect ending to complete our South American vacation. Leo is a terrific guide, one of the best we have ever had; knowledgeable, personable and accommodating to our every need. 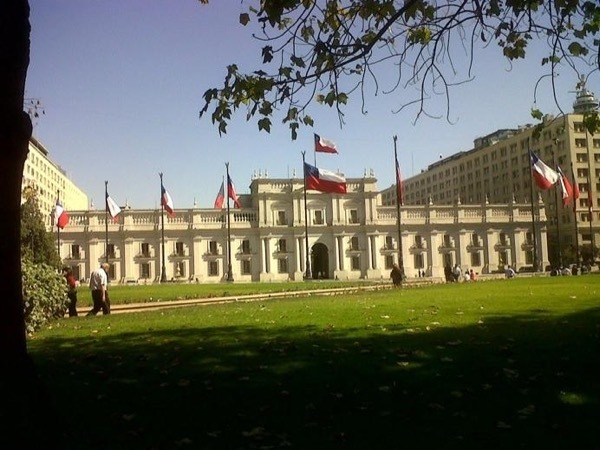 He is very knowledgeable about all aspects of Chilean life, culture and history. We only wish we had the time more for another tour. We will definitely tell our friends about his comprehensive tour! Leo was wonderful. He spoke fluent English and was great fun. We are a party of 8 and we agreed that his happy demeanor set the tone of the tour. We learned a lot and laughed a lot: we would highly recommend Leo. Fantastic tour! Leo is one of the greats; he is informative, interesting and so friendly and fun that we both felt like we'd known him for a long time. The area we went to - Maipo Valley - was beautiful and the mountain ranges spectacular. We were able to experience a local restaurant with wonderful food and even nicer people which was the highlight of our trip. I would recommend this trip highly especially with Leo -- he really made the trip something very personal and special! Leo is the man....very personable, very flexible, great sense of humor!!! I will gladly recommend him to anyone touring Chile! Leo is an excellent tour guide. Our transfer from our Santiago hotel to our Valparaiso hotel was not just the transfer for which we paid, it was an excellent tour. Leo puts himself in our shoes and treats his guests as he would want to be treated. He speaks several languages and his command of English is excellent. His vehicle is nearly new and very comfortable for 4 persons and their luggage. What a dynamo Leo proved to be! His zest for providing maximum satisfaction to his clients makes the tour enlightening and enjoyable. He shares his favorite vistas and people with us and made us feel like our pleasure was foremost in his agenda. Leo is the best tour guide we have encountered to date. Leo was a treat. His passion for his country shines through. He is a great embassador for Chile. His tour is very personalized and informative. He takes you where the locals go. His English Is excellent and he is an excellent communicator. We had a great day in Vina Del Mar and Valparaiso. Thank you Leo. Leonardo was on time at the Santiago Airport. He was right where he said he would be. Leo was personable, knowledgeable about the area, friendly & accommodating. His driver was very friendly and did an excellent job getting us around. One of Leo's specialties was getting us to special areas where we could take memorable pictures, which he helped us to create. His lunch spot at a winery was outstanding. Although pricey, the food and ambiance was worth it. Highly recommend Leo & the huge Mercedes Van. Leo was fantastic, we were a group of 3 adults and 3 children ( aged 11, 10 and 8) , he was so accommodating to our girls , which made our day so much easier. His knowledge of the areas was fantastic , we certainly would not have seen anywhere near the amount of places in Valparaiso without him. ( amazing place great cultures) He is a photography buff so he took great photos of us all, which was great as we were all in the photos. True keepsakes of an amazing day with Leo. I would highly recommend Leo.